Product prices and availability are accurate as of 2019-04-10 09:26:09 EDT and are subject to change. Any price and availability information displayed on http://www.amazon.com/ at the time of purchase will apply to the purchase of this product. The Nordic Pure MERV 11 pleated allergen reduction electrostatic air filter will vastly improve the air quality in your home or business. With each pass through your MERV 11 pleated air filter, the air in your living space improves. This electrostatic air filter attracts and captures airborne dust, pollen, mold spores, pet dander, smog, dust mite debris and baking flour. The MERV 11 pleated air filter is made of synthetic material that will not support the growth of mold and bacteria. Along with the reduction of dust on surfaces, this MERV 11 pleated air filter will attract and capture the small, allergy-aggravating micro-particles that can cause your family discomfort This high performance air filter will outperform non-electrostatic fiberglass, washable, or disposable poly filters. 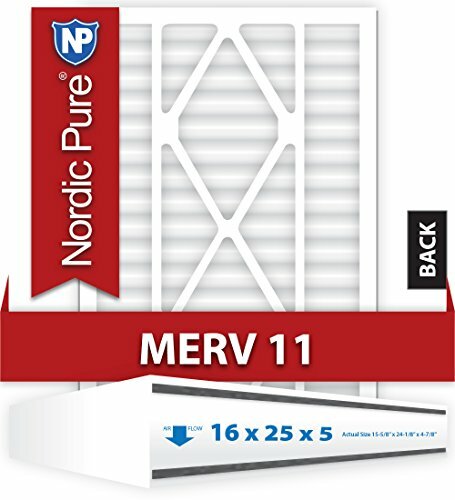 The MERV 11 pleated air filter is comparable to MPR rating of 1000. Particles in indoor air are measured in microns, which are 1/1000 of a millimeter. A human hair is about 70 microns wide. This high performance air filter will outperform non-electrostatic fiberglass, washable, or disposable poly filters. Nordic Pure air filters have an actual size that is a fraction of an inch smaller than the nominal size. With the 4" and 5" air filters there is a wide variance between the nominal size and actual size. Almost ALL filters have a different actual size than the nominal size printed on the filter so it is best if you measure your filter for the EXACT size and compare it to our "Actual Size. This is why we ask you to measure your filter so you aren't surprised if the filter doesn't fit! Our MERV 11 four or five inch air filter should be changed at least every 6 months depending on your environment. Changing your air filter at the recommended time will help maintain a healthy environment as well as keeping your air conditioning and heating systems running efficiently.